In countries like India, where Dowry is common, this was due to the perceived low value of women in the society. A family gaining an additional woman was gaining a burden. Within Nigeria, the bride price reflected the high value of a woman within her family, where her marriage was a significant loss of an economic asset. Here, you find bride price occurs within the ethnic groups where women took an equal part in earning an income for the family, trading or farming. There is a correlation between the prevalence of a bride price and a society valuing its women highly, (all other things being equal). Even the UK historically, had a dowry system which disenfranchised so many women while they were unable to inherit their family wealth. Yoruba traditional weddings today still symbolically have the groom’s family paying a bride price -usually in the form of baskets of farmed goods. Even when the parents are known to be billionaires, I doubt anyone at those weddings seriously believes that a daughter is being “sold” for a few yams and bananas. In exchange, the bride’s family traditionally bears the cost of the wedding. These acts are symbolic gestures of the merging of families or, if you like, the granting of a licence to marry. I believe that Bride price is really a purchase of family, and no more sexist than a woman changing her surname from her father’s to her husbands. Neither is an indicator of ownership, but of kinship. There are many issues degrading women and girls in Nigeria, everyday sexism ruining the lives of females all over the country, but Bride Price is not one of them. I’m glad to come from a part of the world that rejected the dowry system for bride price. That’s it. You will not be charged to leave a comment on this post so take advantage by leaving your thoughts below. I stand on existing protocol. I was devastated this morning when I heard you recently lost up to 2,000 of your cows to marauding cattle rustlers in Kaduna. I can only imagine what you are going through at this time. I don’t have any cows myself but if I did have any and someone stole them, I’d be mad as hell. 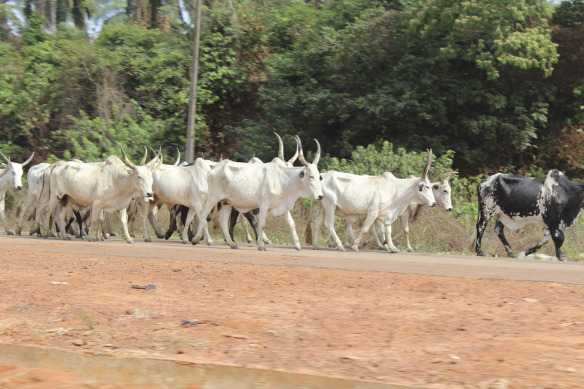 The Special Task Force (STF) on Jos crisis code-named ‘Operation Safe Haven’ has revealed that 260 people were killed, while 2,501 herds of cattle were rustled in 160 attacks in the state in the last six months by unknown gunmen. It is not fair that what other people took a whole 6 months to suffer, you have suffered in one day. But we need to properly identify the problem before working out a solution. Indeed, over the past few years, sheep rustling, that most ancient of crimes, has become a very modern epidemic – so much so that it has made the agenda at this week’s National Farmers’ Union (NFU) annual conference. According to NFU Mutual, the insurance company linked to the union, claims by farmers for stolen livestock rose 170 per cent between 2010 and 2011 – a period of rising meat prices. In 2012, the most recent year for which there is data, 69,000 sheep, worth an estimated £6 million, were stolen in Britain. Northern Ireland was the worst-affected area, with 28,878 sheep stolen, followed by 18,000 thefts from the ancient upland farms of Northern England. In the South West, there have been 5,901 cases. The only minor difference is that farmers tend not to get killed there in the name of rustling, but let us not be distracted by that as it is neither here nor there. Cattle born in or imported into Great Britain since 1 July 1996 must have a cattle passport. This identifies them and their movements and must remain with them throughout their lives. Sir, in America the story is the same where drug addicts steal cattle to fuel their addiction. So as you can see, the story is the same everywhere and it is merely Nigeria’s turn to enjoy experience what other great countries have been experiencing. Now that we have all this information, I believe we can launch a 5 point plan to get your cows back and defeat this menace once and for all. I will list the plans below so as not to take up too much of your time. 1. There is no point re-inventing the wheel – We live in an age of viral hashtags and as we have recently seen with the Chibok Girls, it can help in drawing the world’s attention to an issue. Just like the kidnapping of the girls in Chibok was by no means the first such incident, we can use your plight and the number of cows you lost to bring global attention to this issue. I propose the immediate launch of a #BringBackOurCows hashtag. We need to go big on this so we should use the International Conference Centre Abuja, where your government has launched many things this year alone, as the venue. I do not know what the musician Zaki Adzay is up to these days, but given newspaper reports of him allegedly beating his wife, I reckon he doesn’t have much going at the moment and will be available for this work. His torchlight and stick can help capture the imagination of the public as a symbolic cattle rearer. Failing that, we can draft Ice Prince Zamani to do the job. 2. We will also need international heavy hitters to do the needful in getting this hashtag to trend. Michelle Obama wouldn’t know a cow if it strolled across the White House lawn and waved to her. So I say we shouldn’t waste time with her. George W. Bush always played up his image as a Texas cowboy and inspite of all the reputational damage he suffered on account of the Iraq war fiasco, I believe he can do a job for us. An image of he and Laura Bush wearing cowboy hats and sitting on their horses, lasso in one hand, and a #BringBackOurCows placard in the other hand is bound to reverberate across the internet. It is also a good time to hire Matthew McConaughey given his recent Oscar award and how he likes to play up his Texas cowboy persona. After these 2 specific targets, I’m sure celebrities will be falling over themselves to #BringBackOurCows. 3. Mr Vice-President, we will also need a distraction. Again, what works is what works and no one can deny that the First Lady has done a yeo-woman’s job in the quest to sow doubt about the fate of the missing Chibok girls. This distraction is important so that we can get the cattle rustlers to let down their guard. We need to raise doubts as to whether any cows were stolen at all and also downplay the number at the same time. Consistency is not required if we want to sow doubt – we can say one thing in the morning and say another in the evening. The security men at your farm will be brought to Aso Rock and live on NTA, the First Lady can interrogate them with questions like How many people waka come thief a whole 2,000 cows? Na wake dem waka come abi na trailer dem bring? Sekurity, you dey sleep dat time? It’s a bit awkward that Kaduna where this happened is controlled by your party, the PDP but this is a minor inconvenience. We can simply look for the highest ranking member of the APC from Kaduna and with heavy innuendo, blame him for it. I recommend Mallam Nasir El-Rufai as the target. He talks too much anyway so it wont be hard to get anyone to believe he was behind the dastardly plot to steal your beloved cows. 4. We will need properly targeted demonstrations to ensure they don’t backfire on the government. Thank God Oby Ezekwesili is presently occupied with the matter of the Chibok girls and in any case, it is not on record anywhere that she has a fondness for cows. Nevertheless, we cannot be too careful – any attempt by her to ‘milk’ this protest will be swiftly met with the launch of the hashtag – #EzekwesiliBringBackOurCows to focus the searchlight on her. We can also sponsor a few people on social media to start alternative hashtags like #ElRufaiBringBackOurCows or #APCBringBackOurCows. This will complement the efforts in point 3 above by creating a distraction that lulls the rustlers into complacency. Any attempt to pin this incident on insecurity in the country must be robustly countered by Messrs Maku and Okupe that this is a global phenomenon which just happens to be Nigeria’s turn to experience and strongly telling people to direct their protests to the rustlers who stole the cows. This is where we will need the cooperation of the Miyetti Allah Cattle Breeders Association of Nigeria (MACBAN). No effort should be spared in mobilising them for protests across the country. You will have to join in these protests and wear whatever the colour of the protest is. I suggest you lead the protests from the front. Where you will be protesting to can be decided later but I suggest a secluded part of town or any forest we can find. We don’t need to go inside the forest – we will merely stand at the entrance and chant #BringBackOurCows. 5. Once we have done the points listed above, there should be no need to send in soldiers to look for the cows. We need to forestall any charges of hypocrisy or ‘one rule for them, another rule for us’ that the opposition are bound to opportunistically jump on. I strongly believe this. They will #BringBackOurCows to us and there will be newspaper pictures of you being reunited tearfully with your cows. If we move quickly, we can get the cows back before the rustlers are tempted to start eating them. This is the last straw and we must never again turn the udder cheek to these rustlers. …I have written a post on the time I spent backstage at the recording of Bloomberg TV Africa’s Football Dynamics show. I had a lot of fun doing this. The post is here. I spent a large chunk of my afternoon yesterday debating with Mr Gbadebo Rhodes-Vivour on GM foods and their entry (or not) into Nigeria. Mr Rhodes-Vivour has been mounting a vigorous campaign against the introduction of GM seeds into Nigeria with Monsanto in particular bearing the brunt of his withering criticisms. Even more interestingly, he has managed to assemble a coalition of people to publicly protest GM foods in Nigeria. I didn’t think it was possible to assemble 200 Nigerians for such a cause in public but we learn everyday. I have no problems with GM foods and I believe they play a crucial role in the arsenal we humans can deploy to fight hunger and disease. But Mr Rhodes-Vivour’s piece in The Guardian yesterday got me thinking about something – in my decade and some living in the UK, I have never heard of someone dying of a ‘brief illness’. For example, bio-tech-improved tomatoes are engineered so they do not rot quickly. Advantages include a higher income for the farmer. What is not considered is that the perishability of that tomato is linked to the human body’s ability to digest it. When the human body cannot get rid of it, it becomes toxic to the body and this is how cancers and other diseases come about. That in itself makes this hybrid unsustainable. Genetic variety is important, which is why nature frowns on inbreeding. Our health suffers when our only consideration is profit. Illnesses, such as organ failure, sterility and cancer have all been linked to GMOs. This is a very clever device to use – who wants cancer? Leave aside that he doesnt supply any evidence for such a claim, he’s playing into the common belief that ‘cancer is an oyinbo disease’. As such, it is something that can come into our country through these foods if we are not careful. Afterall, don’t we regularly hear about one oyinbo person or the other dying of cancer? Back to my point about brief illnesses – even when someone lives till say 110 years of age and then dies, you still get to hear the actual thing that killed them, not just old age. Or when someone has been publicly battling cancer and then finally dies, if you look, you will find the thing that finally killed them (often pneumonia). My conclusion is that the first shot was to the arm, the non-fatal shot, and the second was to the chest, the fatal shot,” said Pounder. He later told jurors it would have been impossible for the bullet to follow a 46-degree trajectory inside Duggan’s body if he had been standing “more or less upright”, as V53 told the inquest last month. In this case the matter could have ended with the policeman’s account, afterall the guy is dead, what use will it to be know? Nevertheless, we know which bullet killed him as a matter of public record. It is this difference in painstakingly investigating deaths and documenting them that makes it possible for people like Mr Rhodes-Vivour to successfully scare people into believing that cancer is not something we currently have and can only be imported into ‘our land’. Nobody knows for sure what is killing Nigerians. My late Uncle, Gani Fawehinmi, spent 6 months in Nigeria being treated for pneumonia in an expensive private hospital. It wasnt until he came here that it was discovered he actually had lung cancer. Those crucial 6 months are probably the reason he’s not alive today. Mind you, he never drank or smoked and used to jog and swim every week. This anyhow approach to investigating issues and properly responding to them has plenty of implications, not least for public policy. Where ignorance is elevated to a virtue, anything can turn up to derail even the best laid plans of any government. A mere rumour can damage the implementation of a policy even when a government only means well with it (this is not a defence of this government by the way, but a general point). We have invented the wonderful catch-all of ‘a brief illness’ that covers a multitude of sins from HIV to cancer. Out here, at worst, you will get the cause of death listed as ‘unknown’ which allows the authorities to leave the case open until perhaps new information is available which sheds new light on the death. But no one uses ‘brief illness’ the way we do as a way of ending the matter and avoiding any serious investigation. Are the 250,000 bt cotton farmer suicides in India sustainable? Raj Patel, and academic and writer, who has spent time looking over the data and travelling across India and the world concluded in his book, Stuffed and Starved’, that around 17,000 Indian farmers killed themselves every year between 2002 and 2006. How Mr Rhodes-Vivour arrived at 250,000 farmers remains a mystery. Still, even one farmer committing suicide is a tragedy. So what is causing those suicides? 1. The NCRB merely lists suicides in a particular employment category, but that does not mean farming or crop-failure is the cause of the suicide. There is thus an outside chance that both Gujarat and Kejriwal are right, and both are off the mark. It all depends on what was the real cause of the suicide – crop failure or some other reason. 2. High or low suicide rates are a function of a state’s overall suicide levels. Thus the data to compare is the suicide rate among farmers against the overall suicide rate in a state. Here, Gujarat is not an outlier. Farmer suicides as a percentage of total suicides in the state ranged from 8-9 percent. Andhra, Karnataka, Uttar Pradesh, and Maharashtra fared worse. 3. There is no mention of landless labourers, landed agricultural labourers, no indication if this includes small and marginal farmers (It probably does). So even the current data may be an underestimate when talking about suicides relating to farming conditions gone bad. In other words, the reasons for the suicides are most likely varied and complex. How Mr Rhodes-Vivour makes a leap from this very tenuous link to conclude that Bt corn is the cause of the suicides of 250,000 farmers is a remarkable exercise in truth economy. So what’s the story on GM foods? There is plenty of scientific research on them and it will be hard to find any serious research that concludes that they are harmful to the body. While some of the benefits might be overstated (especially regarding yields of some varieties), that is not the same as saying they kill people. For a good primer on GM foods with plenty of links, see this Vox article (click through the 16 cards). For something that has been the subject of much research and debate, there really isn’t any need to use hyperbole and exaggeration to make your case. It is perfectly ok to read the evidence and come down on the side of skepticism about GM foods. But if your case is strong, why shout so loud? Someone had to do the hard work of attending the World Economic Forum in Abuja last week. Yours truly braved the odds and made it out alive. My summary of the event will be up at Republica shortly. Don’t hold your breath though, nothing terribly exciting to report. 1. Almost all my friends in Lagos have drivers. The reverse is the case in Abuja – with the exception of one friend of mine, everyone drove themselves. I also found the use of GPS navigation systems around Abuja quite interesting. I am one of the laziest drivers around and use my SatNav here even to places I have been to before, just to be sure I don’t get lost. I think it’s a good habit and aids discovery of new places or at least removes the fear of visiting new places. 2. Lagos is a godawful mess. I don’t know why I noticed it this time around but the city is truly filthy. I went to visit with family in Surulere and I didn’t have a car to leave there. The road has only recently been paved with interlocking stones so I decided to walk down when leaving until I could find a cab. I walked less than 200 metres and I felt like I was covered in grime. Part of the problem is that there’s not enough regeneration going on in Lagos. Many places look exactly the same as they have done my entire life. I strongly believe this is linked to our Land Use Act which makes it difficult to have an active market in land or perhaps allows Governors to erect as many roadblocks as they like to the formation of a market. There are whole areas of the town which need to be razed down and rebuilt but when transaction costs of buying property can come to 30% when is that ever going to happen? That any serious economic activity takes place in Lagos inspite of the chaos is indeed an awesome wonder. 3. Every man and his dog knows that the cost of doing business in Nigeria is a real problem. What is less clear is what exactly are the kind of costs one might encounter in carrying out business in Nigeria. We spent almost N1.5m on our new generator. The day they were going to deliver it to the office in a truck, my partner called me to say they had been stopped by police who were demanding N30k as washing for the new generator. We knew that area boys were ahead and were going to harass us for their own money too so we quickly negotiated the police price down to N10k and insisted that they escorted us to our office and wait with us while we offloaded it into the compound. The area boys still came after the police had left but by that time we were able to get away with only paying them N10k. One time we went to do a photo shoot for an advert and area boys came and seized our cameras. We had to pay to bail them out. He was able to achieve a N10k saving on his generator transportation and installation costs. In a way, by cleverly playing off the police against the area boys, he was helping Nigeria’s ranking on the World Bank Doing Business Report by reducing the cost of doing business in the country. Some of the soldiers fighting Boko Haram have said they have seen some of their former colleagues that were trained in Gombe fighting against them as Boko Haram. Some have even reported seeing former militants from the Niger Delta fighting on the side of Boko Haram. Perhaps Boko is not always Haram. I also heard about a relation of General Buba Marwa who is in the army. Apparently his unit in Borno came under attack by Boko Haram and only him and another soldier managed to survive by diving into a stream while the insurgents fired shots inside the water. But in the Nigerian way, he has since been arrested and has been kept in detention to answer how it was that he did not die in the attack. I cant seem to find anything about this story online so if anyone has any detail on this story (if true) please use the comments section. I understand General Marwa has publicly spoken about it. 5. Yours truly is a trenchant critic of President Jonathan. But to maintain credibility, one must give him credit when he gets something right. I am not exactly sure how he did it but he was definitely the one who brought jogging to Nigeria. An early morning drive around Lagos and you will see people everywhere jogging and exercise. To the point where, in typical Nigerian fashion, joggers stand in the middle of the road and tell cars to move for them. This can never be a bad thing so we commend the President on this transformation. Since we are on the subject of President Jonathan…. Observing President Jonathan at very close quarters for 2 days in Abuja was quite revealing. It is one thing to listen to him or read his words, it is quite another to hear him in the flesh. What is clear is that his grasp of issues is extremely and painfully limited. There is no evidence of any depth to the things he says at all. Yet, that need not be a permanent problem – it can be overcome by better preparation as many world leaders have been known to do. This is where the problem is compounded – he clearly does not spend time preparing for his public appearances. 2 examples from his speech at the opening plenary – With the Chinese Premier, Li Keqiang, sitting right beside him, he said the population of China is ‘1.2 billion or 1.3 billion’. Actually, the population of China is now at 1.36bn. The difference he casually uttered is easily more than Nigeria’s population. Yet, a simple search could have prepared him for this if he needed to make reference to it at all. Is this the fault of his aides? Perhaps, but then for a PhD where is the curiosity? He also said Nigeria is trying to copy Bolsa Familia from Brazil and then bizarrely added ‘I don’t know the correct pronunciation’. Why? This was an interesting revelation because in 2012, his Senior Special Assistant on MDGs, Dr Precious Gbeneol, said they were ‘considering‘ adopting this same Bolsa Familia programme after a tour of Brazil. 2 years later we are ‘trying’ to adopt it and the President doesn’t even know the correct pronunciation. All the recent remarks credited to him – Nigerians are not poor because we have private jets and corruption is not corruption but mere stealing – for which he was ridiculed were repeated at WEF. He also added a new one when he said – in trying to cast doubt on the altruism of the Occupy Nigeria protests – that the protesters were being fed during the protests with food from ‘Kingsway’. One can understand that the President has never lived in Lagos, but Kingsway? Perhaps his aides have found a way to completely shield him from criticism but that then means he actually believes that mere stealing is not corruption etc and needs to be told that makes no sense. As someone said to me – even if he bypassed all his aides and went to the cleaner in Aso Rock and said ‘You know say dem bomb Abuja yesterday, how you feel say e go be if I go dance for PDP rally today for Kano today?’, the cleaner would have easily told him ‘Oga, I no think say e go pure if you do am like that‘. In other words, anyone could have told him it was a bad idea. Does the President not know this? There is evidence that his aides compound the problem for him – for example Abati picked a spot under a Transcorp Hilton plaque for the president to address the press from. [I overheard people asking who picked that spot and one of the pressmen saying it was Abati]. Of course the pictures then went out with the President looking like a spokesman for the Hilton Hotel. How hard would it have been to scan around to ensure there’s nothing unnecessary in the picture before picking a spot for him? This is anyhowness on steroids. On Thursday, various leaders and businessmen were heading out of a meeting room and everyone gathered round the entrance to take photos as they came out. The President came out with around 6 security guards around him (in front and behind him as well as beside). The problem with this was that all the guards were taller than him so it was hard to see him. He walked by without waving or smiling to anyone while everyone just watched him in silence. Contrast with Kagame who came out with all his guards behind him and he leading the way – the President was constantly being directed this way or that to the point where one of his security guards put his hand on his back and gave him a gentle push to guide him into a room. This might be understandable if the events were taking place outdoors but it was all indoors and the President was supposed to be the chief host. Instead Tony Elumelu and Aliko Dangote ended up doing the work of schmoozing the guests and smiling for the cameras. He was on a ‘Partnering for Prosperity’ panel with a number of CEOs and tried to make an argument for protectionism. One of the other panelists then countered him not so subtly as to the dangers of this type of policy (he was touting Dangote’s wealth as something that was a result of government policy and also suggested that the insecurity in the country was an opportunity for investors), the way he responded showed that he had not even considered that this policy has weaknesses. He simply conceded that argument by saying ‘you are the expert’ and smiled. All of this was painful to watch and people sitting beside me were either laughing or sighing. Yet it will not deter those who are supporters and admirers of the President. You might even say this is all nitpicking which it probably is. But we really have to ask ourselves how we gave such a demanding and difficult job to a man who by all accounts will be perfectly happy doing something else. 6. On my way back from Abuja with my friend, Mallam Nasir El-Rufai was on our flight. We quickly accosted him when we landed and introduced ourselves. Long story short, he was on his way to Ijebu-Ode for the Awujale of Ijebuland’s – Oba Sikiru Kayode Adetona, Ogbagba Agbatewole II – 80th birthday and was waiting for General Buhari to arrive. He then asked us to come along with him to Pastor Tunde Bakare’s house (C’est Magnifique) where we spent 2 hours discussing Nigeria, Boko Haram and the APC. He was very candid and open about all the challenges in the APC. Much of this is bound by confidentiality agreements but suffice to say that before we could attack him and the APC for not living up to the hopes and aspirations of what we want in an opposition party, he himself went ahead to list all the issues and then some. Now, Mallam is a very smart guy so I don’t know if everyone else in the party leadership has a grasp of the issues in the way he does, still it was refreshing to see that they are not deaf afterall and fully understand the scale of the challenges ahead of them. I’m not impartial in all of this of course – it is my prayer that President Jonathan gets defeated in next year’s elections. But the chances of that happening is something I am realistic about. If this is a view you share, then help the APC in any way you can. It is not just to get a particular person elected or even to get rid of one person. It is to help our democracy work better for all of us. Our service charge year runs from November to October and last year we budgeted N18m for diesel for the current year. As at last week they had already spent over N15m and we are just halfway through the year. So now they have stopped 24/7 electricity during the weekend…we are now on 6pm to 10am while they try to work out how much extra we need to pay. Something like this is actually a good proxy for the electricity situation in the country. 8. Message for those who want to go into government to change things – it is more than likely you will spend a huge chunk of your time on extra-curricular activities. For example, you might be chased about by Niger Delta militants seeking contracts or favours or a legislator changing laws just to show you who’s boss. Be guided as you go in. That was in reference to the Barcelona Hotel. It was one of the 3 official hotels for WEF and every single person who used it complained about it. Mind you, it’s a new hotel so the complaints were about the poor finishing and garish colours used to paint the rooms [which was still smelling]. So why was such a hotel used to host international visitors when Abuja has seemingly better hotels? Well, my usually reliable ‘sauces’ tell me that the hotel is owned by a very senior government official who has a habit of sleeping during official functions. Hence. Generally, I was quite taken aback at how dated and, in the case of Sheraton, run down, the big Abuja hotels were. They looked like things from the 70s with the carpets and paint. I wonder if there is some kind of protectionist policy in Abuja preventing big challengers to Transcorp in particular. Abuja needs new big brand name hotels sharpish. Nevertheless, the chicken suya at Capital Bar in Transcorp is one of the best I have ever tasted. Take that to the bank. 10. I am tired of complaining about the Murtala Mohammed International Airport. We have turned the problem into something beyond us to solve. My favoured solution remains for it to be burnt to the ground and a new airport built. I was in Nigeria last November and neither the ‘new’ arrival hall or departure halls had been opened. The conveyor belts in the new arrival are much bigger so there’s less crowding around when you want your bags. But move close to them and you start to see they are already falling apart with the inner parts all visible and flaps hanging loose. There is no way those machines were bought brand new and in 6 months are the worse for wear in that way. The departure area is a lot bigger and airier so the lack of air conditioning is not a problem in the way it was in the previous place. Yet, you can see the shoddiness of the work done everywhere. Is this thing so hard? Because undoubtedly, we will have to ‘remodel’ or refurbish these ‘new’ ones in a couple of years. After passing security, I got to the area that passes for Duty Free shopping and amazingly, it was like being outside with the way the rain was pouring down through the leaking roof. It was so bad the staff weren’t even bothering to arrange buckets to collect the water. They simply mopped around the edges, presumably waiting for the rain to stop. Why are we like this? How did we allow ourselves to become used to this kind of debilitating anyhowness? You can read this article to get an understanding of how important airport shopping has become. Yet we allow it to lie there wasting like this? The Chinese are building us a new terminal in Abuja. I used Shanghai Airport last year and so I am hoping there is a plan to retain them to manage the new terminal for us to ensure there’s water in the toilets etc. You have to have ‘a guy’ everywhere especially if your time is important to you. My guy who I travelled to and from Abuja with does that trip very regularly. He has a guy in Lagos and one in Abuja at the airports. I discovered the value of having such people when we were leaving Abuja. We got to airport around 6.30am for a 7am flight and found a queue long enough to ensure we missed the flight. So he called his guy who came, took our bags and went to check them in. He returned with our boarding passes in less than 5 minutes, walked to a hidden corner and handed them to us. My guy then gave his guy what looked like a couple of thousand Naira and we were on our way to board the flight. Over here in the UK, last year, the government put forward proposals to charge passengers who want to skip airport queues. The government currently spends around £1.8bn on immigration services annually and manages to recover less than £1bn of that through various visa fees. In other words, paying to jump a queue isn’t really a strange thing. Prices clear markets, as they say. But in typical Nigerian fashion, given that the state is weak and unable to collect even what is its due, this creates myriad opportunities for passage lubrication. I am sure my guy’s guy shares some of his fees with the guys behind the counter which then creates an incentive to slow things down to smoke out the people who will pay to beat the queue. But maybe this is starting to change. I was waiting to meet someone at a restaurant in Lagos when 2 women and a man – all stern looking – walked in and sat around me. One of the women was wearing sunglasses indoors and I have to say I was scared. Next thing the Manager of the restaurant comes round with another staff member carrying a bunch of files and almost prostrates as he greets the visitors who then demanded cold drinks to cool down. As they began talking I made out that they were from the Onigbongbo Local Government and they came to collect some taxes or fees relating to permits or clearance for hepatitis B and tuberculosis. 12. Of course security was bound to be ‘enhanced’ in Abuja in light of recent events so I was looking forward to seeing what it was all about. The good news is that the security arrangements weren’t all that painful to experience as is the case with Nigerians. To my pleasant surprise, I did not see anyone being slapped or beaten for ‘breaching’ security [I tried to take a photo of the President’s car and a gun toting soldier quickly walked to me and asked me to delete it which he supervised]. On our way from the airport to Sheraton in Abuja where we got accredited, I noticed armed policemen all over the place – hiding behind drums, sitting under bridges etc. Before being allowed into Transcorp our name tags were scrutinised and I had to get down from my taxi and enter the official vehicles. All very comforting somewhat. But by evening, the enhanced security had been visibly ‘de-enhanced’. Anyhowness had crept in and people were relaxed. Maybe the tempo of the thing was too high for the policemen and soldiers. The security passes that were supposed to restrict people to certain areas (depending on their accreditation) seemed to work everywhere. The security men at the front door manning the metal detectors and scanners were simply collecting your bags and handing them to you on the other side. Make e no be like say dem no check. [I heard of one ‘breach’ where someone sauntered up to the restricted floor where one of the world leaders was staying at the Hilton]. At the hotel where I stayed, everytime I got back, the security guy would jump up from where he was gisting with someone, pick up his metal detector and tap my bag twice then say ‘You’re welcome Sah!’ and wave me in. Even when the detector went off and flashed red. At Abuja airport, I noticed that the lady checking and stamping boarding passes was stamping each one twice in the same spot i.e. one stamp on top of the other. This made no sense and the only explanation I could think of was that her job had recently changed from stamping 2 different documents to stamping just one. At the Lagos airport, as usual, the people checking your bags are focused on you the whole time asking you to find them ‘something’. The search can be stopped at anytime with the flashing of a N1000 note. Everywhere you go, people are doing things simply because someone told them to do it or they don’t want to be seen not doing it. This does not make anyone safe. And we are entering into an era where we really need to make better security a way of life but everyone is going about like this is 1997. Perhaps we will soon start importing security. Afterall some of the President’s security detail were Lebanese or Israeli from what I could see. The security guys at the Abuja airport did do their job when we were leaving though. Someone gave me 2 packs of Ceres juice which he said were really nice. I then made the stupid mistake of leaving them in my hand luggage. As I was putting my shoes back on after passing through the metal detector, one of the customs officers tapped me on the shoulder and said ‘Which juice is inside your bag?’. I brought them out and showed them to her. ‘Oya drink the one you can drink and leave the rest, you cant take it on board‘. I had completely forgotten about the no liquids business applying to domestic flights. Faced with the unedifying prospect of having to hurriedly down a pack of juice, I started to tell her ‘Don’t worry you can….’. Before I could complete the sentence, she cleared them from the table so with a movement so swift, it was nothing short of magic. When they are interested, they can be deadly efficient. 13. If you live in Abuja and you are flying back on Emirates from Dubai, you’d find yourself having a 40kg luggage allowance to Lagos and then 20kg from Lagos to Abuja not to talk of the stress of changing terminals and then paying for the extra luggage. But is it true that the previous minister needed to be removed from office for this to happen? I prefer to ask rather than engage in speculation and rumour mongering. Conspiracy theories will always be popular. But in Nigeria they are more popular than they should normally be for various reasons – bad education, religion, ‘legacy’ of colonialism. The problem is compounded when leadership fails to lead and open up gaps for the populace to speculate on answers. Nowhere is this is more pronounced than in the ongoing Boko Haram saga. Questions are rightly being asked as to how what was supposed to be a rag-tag bunch of insurgents is able to run rings around the Nigerian Army and even have better weapons. Clearly someone is funding them. The question is who? And how? Here, people are prepared to believe anything and as such will work backwards to the answer once they find an explanation that confirms what they already believe. It’s the Americans! They want Nigeria’s oil and are sponsoring violence to break us up. It’s very hard to argue such arguments as the facts don’t usually matter to people who believe them anyway. The President and the ruling PDP – notably the loquacious Olisa Metuh – in their utterances have the habit of sending Nigerians on a wild goose chase identifying nameless (usually opposition) politicians as the sponsors of the insurgency. As someone who gives short shrift to conspiracy theories, I think the answers are simpler/different from what a lot of people imagine. My own opinion is that we are dealing with a bog standard extremist Islamist insurgency in the image of Al Qaeda. They do not particularly need a motive – the violence is the motive and the means of fighting for whatever it is they are fighting for. These groups are also usually riddled with hypocrisy – like the 22 steps for dodging drones handed out to Al Qaeda operatives as a manual. So how do these groups get funded? Most terror groups are very skilled at crime and laundering the proceeds of crime through the ‘normal’ economy. Over the years they have gotten better and better at integrating their funding into the economy in ways that make it very difficult for such flows to be detected. Thankfully the Americans have some considerable talent in tracking such flows. Last year, the US Justice Department released its findings after a lengthy investigation of the Lebanese Canadian Bank. The investigation was around how Hezbollah – classified as a terror organisation – was obtaining its funding and moving the money around the world. They concluded that the money started from drug trafficking in America before finding its way to Lebanon via West Africa. First, the report states that approximately $13.5bn worth of drugs is transported to Europe from West Africa every year (42, Page 22). We can agree that Boko Haram and other such groups only need a fraction of that to mount an effective insurgency against the Army. The report then goes on to name several Hezbollah operatives who control this drug trade from Venezuela and Colombia to West Africa. They have sophisticated shipping boats and all sorts of equipment to move the drugs around as well. One particular Hezbollah chap called Ayman Jouma was said to be doing $200m worth of drug business per month. This business is very lucrative indeed – a half container of cocaine costs around $17m and can sell for $230m in Europe if you can get it there. But the bit I found most interesting related to used cars. To clean up this drug money, they used Bureau de Change controlled by other Hezbollah operatives. The idea was to use the money to make legitimate 2nd hand car purchases from the US, sell them in West Africa and cleanly move the money to Lebanon to fund Hezbollah. This is how drug money is transformed to clean-looking cash. People buy used cars innocently and pay the market price without knowing they might be aiding (not funding) terrorists to move their money around to avoid detection. This is important to confuse the Americans who might be trying to follow the money – sometimes the money is moved in ways that make no sense and for no reason before it is finally sent to Lebanon to buy weapons or fund terror in some way or the other. 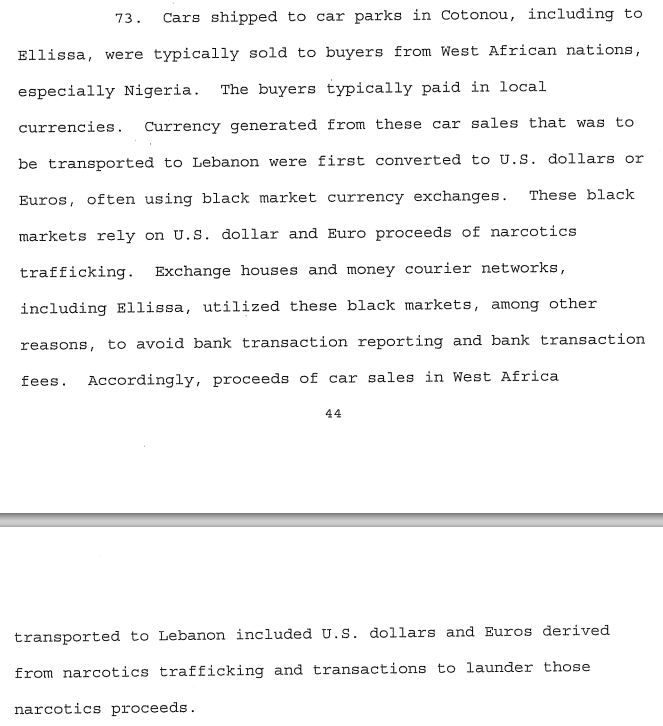 The report goes on to say how the cash is transported to Lebanon via Togo and Ghana. You can imagine how easy it will be to bribe poorly paid corrupt officials at airports to look the other way – this is a billion dollar business and even if they dedicate just $1m to bribing officials, their road will be smooth. You can read the rest of the report which has a lot more interesting detail. The Americans like to investigate these crimes as it allows them to slam heavy fines on banks and companies found guilty. But this does not mean their investigations cant tell us something useful. Nigerian authorities arrested four Lebanese men in the northern city of Kano on suspicion of being members of the Lebanese Hezbollah. Soldiers uncovered a hidden arms cache containing 11,433 rounds of 7.6 mm ammunition, 76 military grenades, one SMG rifle, nine pistols, 17 AK-47 rifles, 44 magazines, 103 packs of slap TNT, 50mm anti-tank grenades, 123mm artillery guns, four anti-tank landmines, 21 rocket-propelled grenades, an RPG, 16 RPG chargers and one RPG tube. The arms and ammunition were concealed under several layers of concrete and placed in coolers, drums and bags, neatly wrapped. The arms and ammunition were intended to target Israeli and Western facilities in Nigeria. As far as I am aware, there has been no direct link between these guys and Boko Haram but I am sure where under the very big tent of terror, common interest can be found between different groups, even if temporarily. The point of all this is to understand that people who are motivated by an ideology of terror can run perfectly legal looking businesses solely with the aim of funding terror. While politicians will almost certainly do anything to win elections, funding terror is counterproductive for politicians who want to attain power. In other words, there is no great mystery to this. Like I said, I am convinced Al Qaeda is behind Boko Haram and their ways and means of funding them wont be much different from that outlined above – the money will start from some illegal activity say, opium from Afghanistan, and then after plenty of zig-zaging, find its way into a legitimate business to clean it up before ending up as terror funding. Just last week, the BBC spoke to some young men who said they had been paid $3,000 to join Boko Haram as fighters [If they have to pay that much to recruit fighters, then there’s an element of good news in that as it suggests there is a ‘scarcity’ of available fighters pushing up prices]. This is consistent with drug money. Conspiracy theories are a waste of time as they stop us from properly thinking through the problems and how we should tackle them. When the government comes out to ‘finger’ nameless opposition politicians, we are none the wiser and the bigger worry is whether the government actually believes that line of thought as opposed to just taking Nigerians for a ride. In fact conspiracy theories are worse than useless in this case because clearly the work that needs to be done in tracking down these money flows is very hard and requires plenty of international cooperation. It is one thing for politicians to deceive us – that is what politicians do – but it is unforgivable for us to go along with them and deceive ourselves. I strongly suspect that the ousted CBN Governor was on to something with tracing Boko Haram funding before he was removed from office and perhaps with a bit more time, would have gotten somewhere useful with it, especially with his international clout. Do we have the capabilities to track these kind of money flows? Are we even trying to find these sources of funding? With a wall to wall corrupt system like ours, even if we find where the money gets to Boko Haram, can we really stop it? The answers are blowing in the wind. One thing I am certain of though is that Boko Haram and their likes can achieve very little without a steady supply of funding. It is this funding that brings up to the level where they become an army able to confront and even defeat the Nigerian Army. Find the money and all other things will be added unto the fight against terror.